The McLaren MP4-12C is a high performance two-seat mid-engine sports car powered by a bespoke McLaren (M838T) 3.8 liter, V8 twin-turbo engine that produces approximately 600 horsepower and 433 lb-ft of torque. 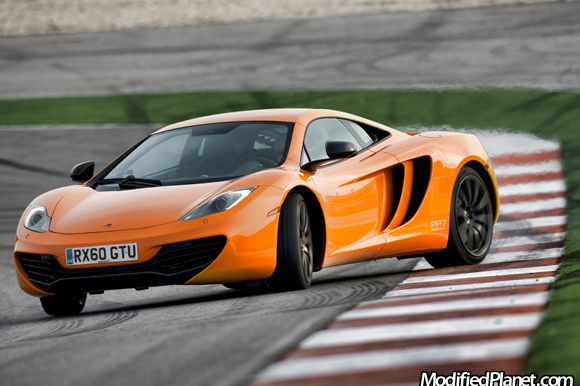 The twin-turbocharged engine drives a McLaren seven speed Seamless Shift dual clutch gearbox (SSG). The McLaren MP4-12C is pure McLaren because this particular vehicle is manufactured with no carryover parts from any other car. Knowing that weight is the enemy in any performance sports car, McLaren engineers focused on making the McLaren MP4-12C super lightweight by using a carbon fiber chassis structure (Carbon MonoCell), lightweight exhaust pipes, a compact downsized engine, a compact transmission, lightweight alloy wheels and the engine cooling radiators were mounted at the rear as close to the engine as possible to minimize the pipework.